For the kitchen utensil, see Fish slice (kitchen utensil). For the English fishcake, see Fishcake. Fish cake or fish slice is a commonly cooked food in southern China and overseas Chinese communities. The fillet is made of fish that has been finely pulverized. It is made of the same surimi used to make fish balls. When production is finished, the fish usually comes in a large frozen rectangular fillet. Prior to cooking, the large rectangular fish mold must be defrosted and cut into smaller slices. Fish slices are often used in Chinese cuisine, especially in noodle dishes. They are commonly found in dai pai dong. Perhaps the most popular use of fish slices is mixing with fish balls or wonton noodles. Another usage in home cooking is to combine them with soft vegetables like cabbage or bean sprouts. 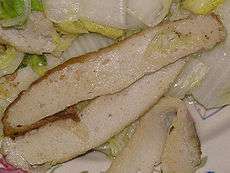 Meats like pork are also sometimes used for plate-dishes. ↑ 吉翔 (22 February 2012). "港老字號名吃"寧缺毋濫"將結業 食家倡授徒留手藝 (Chinese)". chinanews.com. Retrieved 12 August 2012.